The sketch made good on Melissa McCarthy’s cold open as Sean Spicer, where she mentioned that Trump’s tweet in response to the Court’s ruling — “SEE YOU IN COURT” — would take place on “The People’s Court,” the TV show framed around civil court rulings. 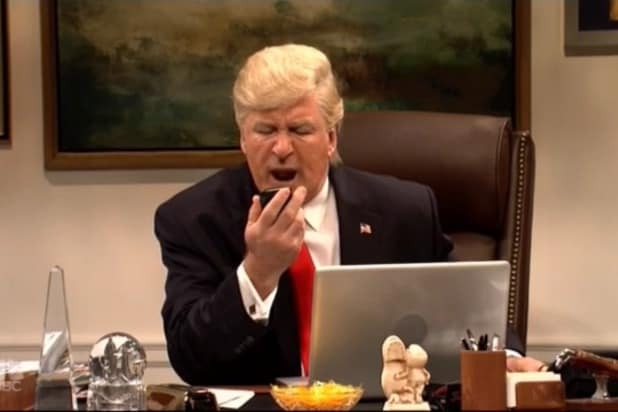 Baldwin’s Trump began by addressing Cecily Strong as Judge Marilyn Milian. You can see the full sketch up above. “Excuse me, Mr. Trump, these three are federal judges, okay? They’re actually more real than I am,” Milian said. Milian asked Trump about the reason for his ban. “It is so simple,” he said. “The bad people are pouring in. And you see them, and it’s ISIS, San Bernardino, Chicago, I mean, look at Chicago. The bailiff knows what I’m talking about. Am I right? “You know, my man, you know — bad hombres, bad boys — I mean, these bad boys, bad boys, what you gonna do? what you gonna do?” Trump finished, quoting from the “Cops” theme song. Trump even called Valdimir Putin (Beck Bennett) as a witness for is case, but was eventually shot down by Judge Milian. The sketch ended with the show announcing the details for its next case: Trump v. a manager at Nordstrom’s.